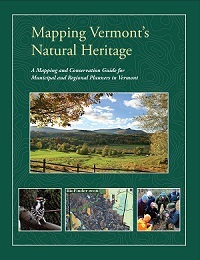 MONTPELIER, Vt. – The Vermont Fish & Wildlife Department is releasing a free copy of the new book Mapping Vermont's Natural Heritage to Vermont towns this week. The book and attached DVD are aimed at conservation commissions and planning commissions to help them learn what mapped data is available on natural resources in their town and how it can be appropriately interpreted. The guide works with the BioFinder website, the Vermont Agency of Natural Resources’ online center for information and maps on biological diversity and natural resources. It relies on the science of Vermont Conservation Design, a tool that identifies the features necessary for maintaining an ‘ecologically functional landscape’ – a landscape that maintains current biological diversity and allows species to move and shift in response to climate and land-use changes. The guide allows communities to better understand mapped ecological components, helping them interpret what each resource is, why it is important, and how to include the resource in planning and conservation efforts. It allows them to prioritize the places that are most important through a 7-step process for integrating natural resource needs with other community values. And it provides options for how to plan for and protect these resources, including non-regulatory and regulatory options, in additional to providing examples of planning and conservation strategies employed by other Vermont communities. Planners can learn more about how to use this guide in planning efforts by contacting Jens Hilke at Jens.hilke@vermont.gov.